La Salle scored 11 runs over the span of two innings, but Rider was able to hold off the Explorers in a 12-11 win at Hank DeVincent Field. 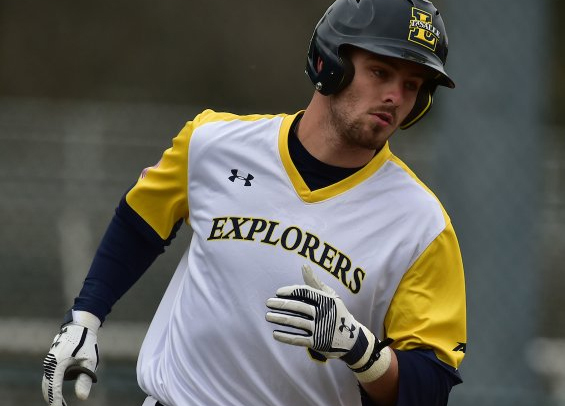 The Explorers came back from an 8-0 deficit to make it a ballgame and had the lead entering the eighth inning, but Connor Hinchliffe ran into trouble surrendering a pair of singles, hit a batter, and uncorked two wild pitches to allow Rider to retake the lead and ultimately the contest. Jack Cucinotta homered for the Explorers in the losing effort while Tommy Toal drove in three runs. The loss dropped the Explorers to the .500 mark on the season. The club will host Delaware State on Wednesday. Liam Bendo drove in the lone run on the afternoon for Saint Joseph's on Tuesday as the club fell to Lafayette, 3-1, in a Liberty Bell Classic quarterfinal at Smithson Field. Matt Cuppari drilled a triple down the right-field line in the seventh inning and Bendo pushed him home via a ground-out to second base. The Hawks collected just four hits on the afternoon. Lafayette scored a run in the sixth as Hawks catcher Andrew Cossetti made an errant throw on a stolen base attempt at third. The runner scampered home to give the Leopards a 1-0 lead. Lafayette went on to score another pair of runs over the next two innings to put the game out of reach. Jake Meyers started for Saint Joseph's, tossing three no-hit innings. He struck out four. The loss snapped the Hawks five-game winning streak. The club will be back in action on Friday to open a three-game set at George Washington.